1. How long have you been in to raw foods? This is my fifth raw summer! 2. How did you discover raw foods? In 2006, I was looking to clean up my diet, to find more energy, to look and feel better. I went to a bookstore to find something about macrobiotics and spotted Kate Wood’s ‘Eat Smart Eat Raw‘. It just made complete sense to me, and I was hooked! Looking back to the time in my life when I’d felt my healthiest, around 10 years earlier, I’d been intuitively eating high raw, without knowing what ‘raw’ was! 3. What were some of the first benefits you noticed? Increased energy and a feeling of being ‘alive’ rather than just existing, if that makes sense. 4. Were there any drawbacks? If so, what and how did you handle? Oooh lots! It was fine at home, but socialising, eating out etc. were tricky. It took quite a while for me to come out of the ‘raw closet’ as I was worried about the reactions of others. I’ve always been one to blend in with the crowd rather that standing out, so this was new territory for me. Now tho, I am confident that this lifestyle is the best for me, and I know that if I compromise myself to fit in, I end up feeling ill…it’s just not worth it! So friends do know; I don’t go shouting it from the rooftops or preach about the benefits of raw, but if it comes up in conversation I will tell people, and I haven’t had the adverse reactions I had feared. People seem to accept it as part of who I am, which is great! When it comes to eating out, I usually phone ahead and request a large salad – people are far more accommodating than you think, and always carry raw crackers etc with me just in case. My mum has been great, once she got over the initial fear that I’d end up dead…after a few months she said, ‘I don’t know about this raw thing, but you look better than you have in ages, so it must be doing you good’ Now, she’s the one telling everyone about my ‘raw thing’! My husband…well that’s another story. He just doesn’t get it, thinks I’ve joined some mad cult, lost the plot, etc. etc. and wants me to go back to eating ‘proper’ and ‘normal’ food. I still cook for him on a daily basis, and have never pushed raw on him, or commented on his food choices. It’s a personal thing, his decision, same as choosing raw is mine. Long story…but this is what has led me to set up my business Raw Liberty, to support people who are struggling to stay raw in a cooked food home. 6. How did you handle reactions? any tips? I guess I just have to believe that it is right for me, and that it is a choice I am making. It may not suit everyone, but I don’t feel the need to compromise myself to fit in with the expectations of others. 7. What advice would you give people who are interested in raw foods on how to get started? Get yourself out there, don’t try to go it alone; go to raw food workshops, pot lucks, events etc. you won’t believe the variety of fantastic recipes you can make, and the support of like-minded people is invaluable. Some of my very best friends are people I have met at raw events! 8. What is your number 1 raw tip? 9. What is your favourite raw food and why? I can’t answer this! It varies from day to day, depending on my mood, the season etc. etc. and there are so many raw food recipes you could eat something different every day. I adore green smoothies and have one most days. On a simple level tho, my favourite food today is mango; it’s sweet, sensual and satisfies on all levels. 10. If you could be any raw food what would you be and why? Mango, for the above reasons lol! 11. How do you see the raw movement in five years time? I’d love being ‘raw’ to be as acceptable today as being vegetarian, so that people wouldn’t feel ‘weird’ or different. A raw food option on menus would be perfect! We should be judged by who we are, not what we eat. 12. What is your business and what do you do? I am passionate about raw food! Through my buisness, Raw Liberty, I inspire and support people who want to live harmoniously raw in a home in which cooked food is the norm. I hold live classes, and individual or group coaching programmes. 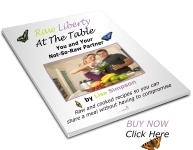 I can show you how to marry raw and cooked recipes, and have created a wide range of delicious raw versions of cooked recipes, so that you can still share meals even if you don’t eat the same food. Check out Emma's blog http://blog.rawfoodscotland.com/?p=599 it's rawtastic!!! 'I am satisfied, fulfilled, and complete. I am ready for new adventures of every kind. What can you release from your life to make way for new and magical things?